For my cousin’s newborn girl- hope she likes it! The tag/ribbon on the right – if u pull that- it reveals a tag where the journaling can be. New record made! Arrived home from work at 445AM!! Prev record was 4 am I think…. I think I need to update more. Eh? That’s what I keep saying each time I update… and I should try not to complain… but then again, this is a blog – a web diary and isn’t it meant for ranting away? Enough of ranting? How has my very very small readers been? Leave a comment to let me know yah? 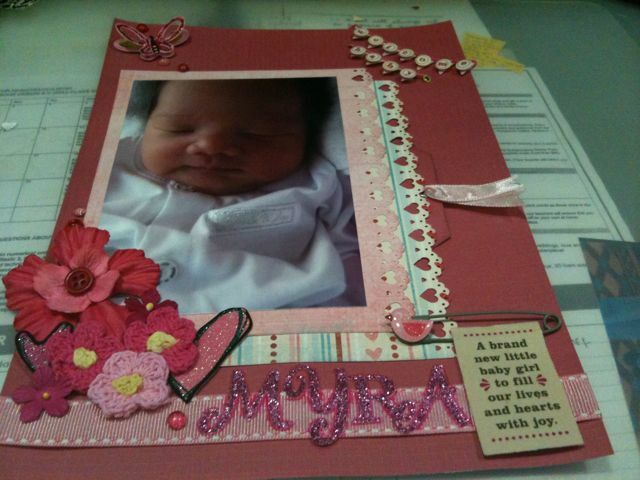 I have started a new hobby of scrapbooking/cardmaking/altering boxes and what nots (latest is a clip board) – have lots to improve on – cos i’m not exactly the most creative – and when I finally have time to sit down to do something crafty and is very inspired – i get interrupted by the daily chores, the mother who wants something down right now kind…. I have taken some pics – they are on my Facebook…. my scrapbook layouts are a bit plain jane though…so..
It’s threatening to rain right now- so it better rain afterwards when I arrive at work – hate driving in the rain esp if I’m that sleepy…. rain harder – no one will come! 🙂 So bad. Wow 2 posts within few minutes! I just realised I have been ending my blog posts with ‘oh well’! Ha. Trivial. But still… must change! What’s the point of downloading the wordpress app on the iphone when u don’t use it? haha. that’s me. Oh well. Toodaloo!! I hope i will update after that!